The team headed to the South Pacific island of New Caledonia, the home of Corvus moneduloides. 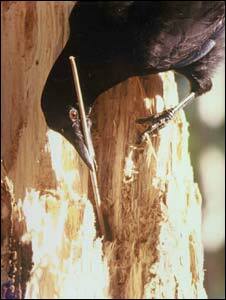 They are the only birds known to craft and use tools in the wild. 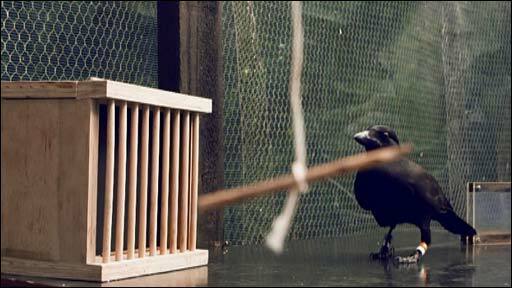 To further understand how the birds perform these tasks, the University of Auckland team set seven wild crows, which had temporarily been captured and placed in an aviary, a complicated problem. The birds were presented with some out-of reach food; a long tool, which could be used to extract the food, but which was also out of reach, tucked behind the bars of a box; and a short tool, which could be used to extract the long tool, but which was attached to the end of a dangling piece of string tied to the crow's perch. Professor Russell Gray, from the University of Auckland, explained: "The crows needed to understand they needed the short tool on the piece of string to get the long tool, and then use the long tool to get the food." The seven birds were split into two groups. The first group of birds were given the chance to try out every individual step in the set-up, before they were presented with the complete multi-stage task. Professor Gray said: "All these birds had to do was to put together things they could already do in the right sequence." Each of the three birds managed to solve the three-stage problem on their first attempt. A second group of birds was presented with a less familiar situation. While they had previously been shown tasks where food was directly attached to string, and sticks could be used to grab out of reach food, they had never been given a situation where a tool was linked to the string or where one tool was needed to collect a second tool. However, when presented with the multi-stage task, these birds also managed to reach their treat. One bird, Sam, spent 110 seconds inspecting the apparatus before completing each of the steps without any mistakes. Another bird, Casper, also completed on his first try, although he was initially puzzled by the string. The other two birds solved the problem on their third and fourth attempts. Alex Taylor, the lead author of the paper, said: "Finding that the crows could solve the problem even when they had to innovate two behaviours was incredibly surprising." 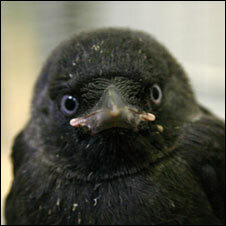 The researchers say that the experiments are helping to shed light on how the crows are carrying out these complicated tasks. Dr Taylor said that while using or creating a single tool could be underpinned by simple learning processes, solving a set of linked problems, suggested that the basis for their innovation is much more complex. New Caledonian crows form part of the corvid family of birds, which also include crows, ravens, rooks, jackdaws, jays and magpies. Over the decades, these birds have been studied for their apparent intelligence. Scientists have been surprised to find western scrub jays that try to deceive their fellow birds by pretending to bury food while they are being watched, jays which perform remarkable feats of memory, and possibly even self-recognition in magpies. 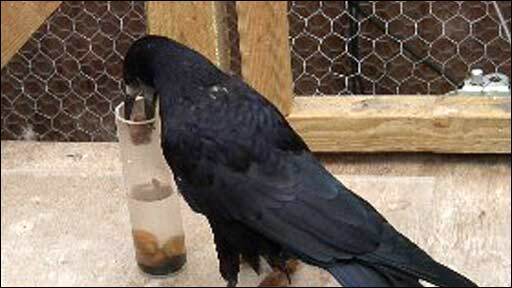 More recent studies have also found that rooks too are able to create and use tools - even though, unlike New Caledonian crows, they have not been seen to use them in the wild. And these birds have also surprised scientists with their problem-solving abilities - most recently, they have been shown to repeat Aesop's fable, by working out that dropping stones into water will raise its height, giving them access to some floating food. 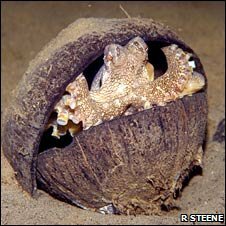 But it might not just be birds and primates with tool-using skills - in late 2009, a paper published in the journal Current Biology suggested that veined octopuses in Australia were using halved coconut shells as tools, by scooping them from the seabed, galloping off with them and then later using them as a shelter. However, some researchers debate whether this kind of behaviour fits the definition for tool-use.